Powers/Abilities: Acroyear was a very strong warrior, displaying enhanced strength, from the resilient Acroyear race. His metallic armor augmented these capabilities and was capable of withstanding extreme heat and a bullet fired at point-blank range plus proton cannon blasts. He had an intensely strong sense of honor and rarely expressed pain. Part of his armament included an energy sword that could cut through almost anything, as well as anti-gravitational glider wings that he used with tremendous skill, yielding great speed and manouvrability. He twice wielded the Worldmind of Spartak, a formidable power that rivaled the Enigma Force. (Micronauts#31 (fb) - BTS) - The Herald Comet (actually the Time Traveler) blazed over Spartak at Acroyear's birth, signaling to the Acroyear people that their new king had been born. (Micronauts I#58 (fb)) - Acroyear's father, the King of Spartak, denied his son from having a relationship with Megale. As the Crown Prince he was already betrothed to Lady Cilicia, who soon after also sacrificed her personal feelings for the continuity of Spartak, both recognizing that their love for each other could only grow. (Micronauts II#7 (fb)) - Acroyear led the Acroyear War-Fleet against the Black Fleet attacking Ecbatan. Acroyear and Illyrie, his second-in-command and repressed love, uncovered a bizarre plot led by its ruler, Laios, but countered by Polibos. The Acroyears were honor-bound not to interfere until Illyrie was killed by Laios. (Micronauts I#9 (fb) - BTS) - With the aid of Baron Karza, Shaitan thoughtwashed his people to ally themselves with Karza, with only Prince Acroyear able to resist. (Micronauts I#38/2 (fb)) - Flying by ship into space to escape Dog Soldiers, Bug came across Prince Acroyear being held prisoner by his brother Shaitan, who intended to hand over him over to Karza and ally the Acroyears with Karza's growing empire. Bug freed the Crown Prince from his energy shackles and the two fought Acroyear warriors loyal to Shaitan, escaping in a commandeered spaceship. Prince Acroyear then declared to Bug his undying friendship. (Micronauts I#12 (fb)) - Shaitan was nevertheless able to recapture Acroyear and sold him into slavery to fight in Karza's arena as entertainment. (Micronauts Annual#1/3 (fb)) - In stasis bonds, Acroyear, Bug and many other offworld prisoners were escorted to holding pens for the brutal Great Games. Later, training in the yard of the gladiators, Acroyear was targeted by the Imperial Gamesman and a fellow gladiator, Maccabee, but they were quickly overcome by Acroyear's strength. Acroyear was then handed his energy sword by a Shadow Priest. Acroyear and the other fighters were soon herded into the arena and he destroyed a looming Terraphant and then a Hornetroid. Despite calls from the crowd for their freedom, Karza chose to have them fight again. Bug and Acroyear the spotted Mari (later Marionette), but didn't know who she was except that she was a member of the underground resistance. (Micronauts I#1) - Acroyear and Bug rescued the newly returned Arcturus Rann during a brawl in the so-called Pleasure Pits (torture chambers and prisons) on Homeworld, now under the despotic rule of Baron Karza aided by Shaitan. Soon in the arena to fight as entertainment, Acroyear and Bug safeguarded Rann and destroyed a Death-Tank. The three fled from the arena to Rann's ship, the Endeavor, meeting up with Marionette and Microtron, plus Rann's roboid companion, Biotron. They all then escaped through a breach in the Spacewall. (Micronauts I#2) - The team arrived in Florida on Earth, but locked in miniature form. They encountered and befriended the youth Steve Coffin, but initially stunned his pet dog Muffin. They were suddenly attacked by Shaitan and Acroyear battle cruisers, who was pursuing his blood feud with his brother. The Micronauts reboarded their ship and blasted away with Steve helping to swat away an enemy ship, although Bug was left behind. (Micronauts I#3) - The Endeavor warped into Daytona Beach, but were dogged by Shaitan in a battle cruiser. Their ship outclassed and outgunned by Shaitan's, Acroyear suggested going on the offensive, using a back-mounted glider-pac to attack a fighter craft. Acroyear succeeded in damaging and destroying several components of Shaitan's craft before the villain warped away. Soon after, realizing that they were likely trapped outside the Microverse, Acroyear declared that they should look for Bug. (Micronauts I#4) - Acroyear and the other Micronauts returned to the Coffin residence to find Bug but found it empty. They then used the smaller Astrostation to look around further. (Micronauts I#5) - Tracking Bug's brainwaves to Human Engineering Life Laboratories (H.E.L.L. ), Acroyear helped rip open the fence into the precinct and they made their way inside where they across Prof. Prometheus threatening Steve and Ray Coffin. Acroyear attacked a guard but was too late to stop Prometheus and Ray Coffin fall into the Prometheus Pit, the link between Earth and the Microverse. (Micronauts I#6) - The Micronauts helped Steve Coffin escape from H.E.L.L. and its Humanoid security guards, riding in a Chevy pick-up truck back to the youth's home where the took off in the Endeavor. They decided to accompany Steve to his father's shack in the Everglades. On the way there, police cars pursued Steve, but Bug and Acroyear, using glider-pacs, helped stop them, with Acroyear smashing the through the windscreen of one car. (Micronauts I#7) - Acroyear and Bug comforted the forlorn Steve until they all learned of the mayhem at H.E.L.L. on a TV news broadcast, but the Micronauts had to defend Steve from the approaching form of the Man-Thing. Acroyear slashed at the swamp creature but was swatted away; he then had to contend with a nearby swamp snake which he soon vanquished. Acroyear recognized the nobility of the Man-Thing. (Micronauts I#8) - The Micronauts and Steve returned to H.E.L.L. where they encountered the newly arrived Baron Karza, now fully sized after linking with Prometheus, battling the armed forces gathered there. Consulting with Colonel Macey, the Micronauts attacked Karza directly, but shrugged off their tiny-sized attacks with Acroyear backhanded away. Returning to the Endeavor, the Micronauts set off for the Prometheus Pit in a plan to either force him to follow them, or leave him stranded on Earth without his formidable resources. (Micronauts I#9) - The Micronauts arrived back in the Microverse only to be surrounded by an Acroyear battle-fleet, which towed them to the Acroyear planet of Spartak. There the Acroyear people welcomed back Prince Acroyear as king, the thoughtwash of Shaitan removed when the traitor returned home. King Acroyear deferred judgment on his traitorous brother and allowed his fellow Micronauts attend the council-of-war meeting. But Karza was aware of the shift in the loyalty of the Acroyear people and launched a full-scale attack on Spartak led by Major D'ark. Acroyear ordered that the attackers be forced to land while he went to the Crystal Chamber to wield the Spartakian Worldmind. Taking off his armor, the crystals formed around him and he became one with the Worldmind of Spartak. (Micronauts I#10) - The first Spartakian king to be linked with the Worldmind, Acroyear had Spartak destroy the opposing fleet, casting rocks, lava and cliffs at them until victory was secured against Karza's Dog Soldiers. Emerging from the Crystal Chamber, King Acroyear no longer recognized Shaitan as his brother, aware that the massive Spartakian losses were due to Shaitan's treachery. Cheered by his fellow Spartakian soldiers, King Acroyear silently doubted his ability to rule a warrior race when he desired peace. (Micronauts I#11) - The Worldmind of Spartak followed the Acroyear fleet led by King Acroyear against Karza and his forces, helping the Baron's physical destruction and ending his despotic reign. 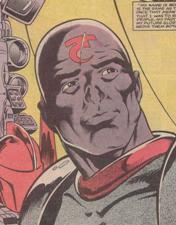 (Micronauts I#12) - King Acroyear stood side by side with his fellow visitors as the denizens of Homeworld cheered, but took his leave as the Acroyear forces returned to Spartak. There, Shaitan was condemned as a traitor but he instead called on the Spartakian law of blood-feud. Acroyear accepted this challenge and the two were later dropped out in the wilderness to fight, each armed also with a spherical force hammer. King Acroyear asked that Shaitan accept exile, but the albino craved his brother's death instead. Fiercely pounded, King Acroyear was able to grasp an energy sword and kill his brother. Justice served, Acroyear saw the Herald Comet flash past. (Micronauts I#14) - Back in the royal palace, Acroyear revealed to Cilicia that he intended to rejoin the Micronauts and leave ruling Spartak to a more able monarch. Bonded to him, Cilicia affirmed she would follow him. The two then met and were welcomed by most of the other Micronauts on the Endeavor, and discovered that Bug had survived the attack on Karza, joining them with his love, Jasmine. (Micronauts I#15) - Acroyear helped the rest of the crew defeat a sudden attack by Antrons that had been sent by Psycho-Man only to have a dire warning sent from the master manipulator's starship. (Micronauts I#16) - The Micronauts were taken on board the spacecraft and put before Psycho-Man, who used his Psycho-Ray panel against them. Acroyear was struck with hate for his beloved Cilicia, and the two repeatedly and fiercely punched each other until the sudden arrival of the Fantastic Four (excepting the Human Torch), but the fighting instead expanded between the two teams, with Acroyear tackling Mr. Fantastic. This quickly ended when the full-sized Human Torch arrived after he went through the Prometheus Pit. (Micronauts I#17) - The Human Torch's flaming arrival began rapidly depleting the finite oxygen stores in the worldship, causing them quickly grow weary or collapse. Rann saved them but Psycho-Man recovered the fastest and imprisoned each of his opponents in his Psycho-Manipulator, intending to siphon their emotions to dominate the Microverse. However, teamwork between the Fantastic Four and the Micronauts helped them escape, with Acroyear and the Thing each pounding through the same point of their restraining tubes. Acroyear then launched a direct attack against Psycho-Man and the teams escaped in their respective crafts, but lost Jasmine. (Micronauts I#18) - Breaching the Spacewall, the Micronauts landed on Earth again, but did not recognize it as such. Acroyear consoled Bug on his loss and helped bury Jasmine. They then left the ship for the robots to repair, with Bug bounding off to be alone, and rolled off in their Star-Searcher, coming across a furnished house their size amidst giant vegetation. What they considered lifeless mannequins inside were actually dolls in a dollhouse controlled by the child Helen Lipinksi. The Micronauts fought the assembled mannequin and drove back to their ship, still unaware that they were actually on Earth. (Micronauts I#19) - Looking vainly for Bug before going into the Endeavor, the Micronauts saw a telepathic image of what Bug could see of a malformed insect. They followed the origins and came across Odd John, who was mutating insects to make an army and intended to do the same with the tiny team, who realized that they were back on Earth. Acroyear and Rann flew out and attacked, but Odd John disabled their ship, trapping those inside. Acroyear slashed at Odd John, who then unleashed his mutated insect horde against them, led by the now monstrously deformed Bug. Shocked, Acroyear was blasted unconscious by the savage Bug. (Micronauts I#20) - Marionette knocked out Odd John, and Acroyear and Cilicia bound him in chains. They then pursued Bug aboard the Endeavor and fought the mutated insect horde at a nearby supermarket, but Acroyear was knocked into a frozen food locker, with ruptured freon gas freezing him in his armor. Microtron arrived in the Astrostation and rescued the two overwhelmed Acroyear warriors. Ant-Man's timely arrival and use of his shrinking gas returned all the insects back to normal, including Bug. Although separated from the rest of the the Micronauts, Acroyear, Bug, Cilicia and Microtron left the scene. (Micronauts I#21/1) - Acroyear, Bug, Cilicia and Microtron scoured the local area for their teammates. (Micronauts I#22/1) - Flying on the NY state thruway, the small group believed themselves to be pursued by semi-trailer, with the incredulous driver blaring the loud horn to get the tiny craft out of the way, but Acroyear flew out and ripped the truck's bonnet off. This resulted in the truck careening off into a fast food outlet where a robbery was in progress by Rodney, the "Best Darned Burglar". Left briefly stunned on the counter, Acroyear recovered but was shot at close range by Rodney. Although knocked back and in pain, Acroyear's armor was not punctured and he retaliated, knocking the burglar back only to be punched backward himself, falling into the boiling oil of a chip-fryer. Unfazed and uninjured, Acroyear was helped out and the four left again in the Astrostation, meeting up with Rann and Marionette. (Micronauts I#23) - The Micronauts found their way back to the Endeavor and Biotron. All of them assisted in the repairs, with Acroyear and Cilicia attending to the Star-Searcher. (Micronauts I#24) - The Endeavor fixed, the team flew off. The on board computer was activated, but this allowed Computrex, the so-called living computer, to take control and force the ship to Computrex's base. The roboids were taken over while the rest of the Micronauts flew out and fought off other technological devices sent to kill them. Acroyear and the others watched on a viewscreen the now captive bodies of Rann and Biotron, held inside Computrex's hardware, until Marionette was able to free them. (Micronauts Annual#2) - The Micronauts arrived in New York for the first time aboard the Endeavor when Acroyear was suddenly overcome with pain and lashed out at his crew-mates before flying out using his glider-pac to discover the source of the pain, yet quickly followed by his concerned comrades. Drawn to Macy's department store, Acroyear flew in where the Toymaster was manipulating Micronaut toys, the cause of the real Micronauts' distress. Recovered, Acroyear fought the animated toys before tackling the Toymaster, who was soon revealed to be Professor Prometheus. Marionette then defeated the Toymaster with Acroyear's energy sword. (Micronauts I#25/1) - In their quarters on the ship, Acroyear and Cilicia revealed their emotions for each other and bonded. However, an attack by the Fixer and Mentallo, eager to gain information on subatomic space for Hydra and following in anti-grav harnesses, left the Endeavor encased in a shroud fired by the Fixer, but the Micronauts retaliated in a fight that forced the two villains to the ground. Acroyear and Cilicia were encased in a crystal shatter-sphere, but the two broke free despite the feedback, and they knocked the Fixer out. 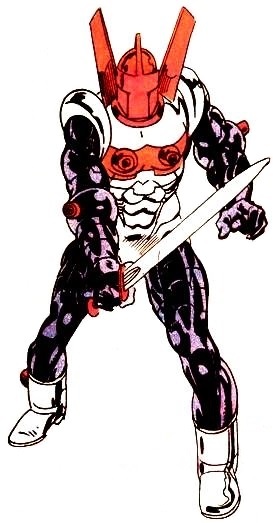 The two Acroyears then joined the other Micronauts as Mentallo was telepathically interrogated and they learnt that Karza had been resurrected and was now controlling the terrorist organization HYDRA. (Micronauts I#26/1) - In the Endeavor, the Micronauts joined S.H.I.E.L.D. 's fight against the invading HYDRA forces using glider-pacs, helping Fury and Dugan along the way, with Acroyear later helping to rip up flooring to trap HYDRA soldiers The Micronauts rejoined, with new Acroyear warrior Dagon (actually a Karza agent), only to discover that Marionette had apparently been disintegrated, and Karza resurrected with the aid of Shaitan and the faceless priests, with the villain also imprisoning the Enigma force. (Micronauts I#27) - Baron Karza sought personal vengeance against Acroyear and refused Shaitan's plea to his brother. Elsewhere, on board a S.H.I.E.L.D. helicarrier, Acroyear was with the other Micronauts when discussing how to thwart Karza's planned conquest of Earth, but remained suspicious of Dagon's ability to traverse the Spacewall. Excepting the roboids and Dagon, the Micronauts then joined S.H.I.E.L.D. against the HYDRA troops and invading Microverse forces, which were arriving through Karza's interdimensional transporter at a Florida fun-park, with Acroyear and Cilicia silencing HYDRA snipers hidden in roller coaster cars. (Micronauts I#28) - Acroyear continued battling, then joined the others on the Endeavor, discovering that Rann had been captured by Karza and was silently furious at Dagon for allowing Biotron to be destroyed. He rejoined the fight, bravely tackling Karza head on. Feeling betrayed, Shaitan blocked Karza's forces, allowing only enemy craft through, but Karza remained resilient against Acroyear. Shaitan then called forth the Worldmind of Spartak to combat Karza and claim power, but was crushed. Acroyear then took on the mantle of the Worldmind to stop Karza, fully aware that this would result in Spartak dying. 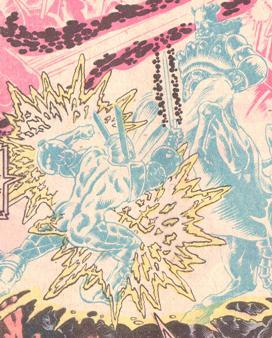 The two were evenly matched until Queen Esmera of Kaliklak launched herself at Karza, impaling him on her suicide sting, weakening the despot and allowing Acroyear to use the last of the Worldmind's power to blast Karza, apparently destroying him, but really only suppressing his consciousness with the host body of Argon. Acroyear considered the defeat of Karza a Pyrrhic victory, given the incredible losses sustained. (Micronauts I#29) - Alongside the surviving Micronauts, Acroyear stood solemnly before the casket of those friends fallen. Acroyear revealed to Cilicia the terrible price paid by Spartak and the Acroyear people, but she called him a traitor. Later, Dr. Leonard Samson helped Acroyear, Bug and Marionette be shot into the brain of Rann, who had been rendered comatose during the battle with Karza. Once inside Rann's mind, Acroyear was confronted by Nightmare, but affirmed that he felt no guilt about the destruction of the Worldmind because it had sacrificed itself to stop Karza through Acroyear. The three "Psychonauts" then defeated Nightmare and revived Rann before warping back into the Microverse. (Micronauts I#30) - Overwhelmed with guilt for destroying Spartak, Acroyear took leave from the Micronauts and returned to his now dead world. Amidst the devastation, he spied a heated crystal from an altar deliberately left by his people and let it sear the Microverse hieroglyph for "T" on his forehead to forever brand him as a traitor to his people, effectively showing that he had been deposed as king by his own people and was in exile. (Micronauts I#31) - Acroyear saw the Herald Comet (again actually the Time Traveler) blaze overhead. Wishing to understand why he had been so fated, he pursued it in his solo battle cruiser spacecraft. (Micronauts I#32) - Acroyear continued to chase the Herald Comet until it suddenly shone much brighter, blinding him, forcing him to crash into the Homeworld molecule called Tropica. (Micronauts I#33) - Blinded and without his helmet, Acroyear was stalked and then attacked by a Devil before a Fireflyte was able to calm the pink beast. The misunderstanding past, the two Tropicans took him to their city of Mirthria, but he did not understand the Devils' quest for happiness through a simple game. That night, the Fireflyte he met earlier restored Acroyear's sight and helped him access the game, finally seeing how the game was to be resolved with the release of a prerecorded message from the Time Traveler and many other Fireflytes, along with the third Key to the Enigma Force. Acroyear, Devil and Fireflyte then left for Dead Zone as per the message. (Micronauts I#34 (fb) - BTS) - Acroyear and Devil arrived on Aegyptia but were captured and held in stasis shackles by the Karza-corrupted Argon and his Dog Soldiers. (Micronauts I#34) - The other Micronauts arrived on Aegyptia on their way to Dead Zone and were imprisoned alongside Acroyear and Devil. Nanotron and Pharoid soon after freed them and the Micronauts escaped to confront Argon, and a bloody battle with the Dog Soldiers quickly ensued until they managed to escape using their Astrostation craft. Pharoid and his cohorts arrived to stop Argon from pursuing them. (Micronauts I#35) - Argon's aerial forces caught up with the Astrostation and Acroyear flew out using his glider wings, deflecting proton cannon blasts and destroying the attacking craft alongside Marionette, Bug and Devil. They managed to escape to Dead Zone, finding Dr. Strange there, and were about to use the three Keys to the Enigma Force to unlock the crypt of Wayfinder when Argon arrived with his Dog Soldiers and Death Squad, comprised of Ampzilla, Battleaxe, Centauria and Lobros. Battleax attacked Acroyear, but although disarmed by him, the Spartakian still overcame his foe and hurled him against Ampzilla. Meanwhile, Rann unlocked the crypt and used the Enigma Force to heal the Spacewall. 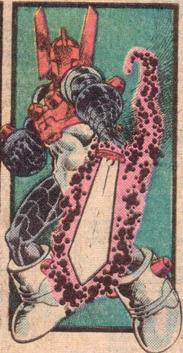 Enraged, Argon declared the Micronauts outlaws and traitors as the team fled in their spaceship. (Micronauts I#36) - The Death Squad, recovered and now joined by Repto and Antron, pursued the Micronauts to Earth and both spaceships crashed into a nearby primary school. The teams split again to battle each other, with Acroyear again up against Battleaxe, until finally ripping his opponent's armor off to reveal DeGrayde, Argon's chief scientist. The Micronauts once more escaped in their ship, leaving a classroom destroyed behind them. (Micronauts I#37) - Argon's newly bioengineered assassin Huntarr attacked the group, with Acroyear flying outside to rescue Bug. The fight took the ship and Huntarr into the Danger Room at Xavier's School for Gifted Youngsters, home of the X-Men, where Nightcrawler was undertaking repairs. Acroyear and Bug followed in just as Huntarr activated the Danger Room's fight mode. Nightcrawler sided with the Micronauts and aided their escape outside the building. (Micronauts I#38/1) - Bug, investigating a nest, had to be rescued by Acroyear from an aggressive bird defending it and the crew made their way back on board the Endeavor. (Micronauts I#39) - Seeking to warp back into the Microverse, the small ship instead appeared inside a comics shop with the crew surprised to see a toy figure of Karza, but soon flew out. Acroyear felt alone but recognized he always had friends in the Micronauts. Their ship was suddenly attacked by the Acroyear Elite dispatched by Cilicia from the Microverse and the Micronauts defended their deposed Spartakian, knocking out many Acroyear warriors. The odds no longer in their favor, the Acroyear Elite fled back to the Microverse, although their warp drive had been damaged by Acroyear the Micronaut. Their own ship damaged, the Micronauts fell into a New York drain awash with new rain. (Micronauts I#40) - Acroyear helped Devil haul the Endeavor to a safe spot by the sewer's side. Bug, seeking those from Earth who had traveled to the Microverse, led the team in search of the Fantastic Four. They quickly befriended young Franklin Richards, who took them to the Submolecular Lab where they came across a swarm of genetically engineered Antrons dispatched by Argon to eliminate access routes to the Microverse. Aided by the Thing, they defeated the Antron invasion but were too late to save the FF's Reductacraft. The Micronauts then left in search of another way home. (Micronauts I#41) - Losing the Endeavor to the sewers, the Micronauts went to Castle Doom in the Adirondack Mountains in search of reduction machinery. They broke in and stumbled into Liddleville, a miniature village crafted by the Puppet Master but taken over by Dr. Doom. Seeing the tyranny there and being the same size as the residents, the group attacked the miniature Castle Doom but were knocked out by gas and thrown in prison by Doom. There they met the Puppet Master and escaped, with Acroyear taking on the micro-sized Doom in a sword fight. Liddleville began to burn and the Micronauts left the chaos behind. (Micronauts I#42) - The Micronauts rested briefly before Bug left to help a woman in distress, with the rest of the Micronauts following in the Astrostation. They arrived at a party held by Janet Van Dyne, also known as the Avenger the Wasp, only to find her engaged in a battle with Dr. Nemesis, both in their shrunken sizes that matched the Micronauts'. Marionette and Bug were struck down by Dr. 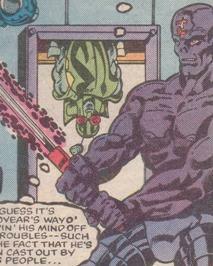 Nemesis' shrinking blasts, but he was defeated by Acroyear, who forced the villain to direct a blast against himself. However, this also resulted in Acroyear suddenly shrinking and disappearing from sight. (Micronauts I#43) - Acroyear, Bug and Marionette shrunk down into the Microverse, falling onto Homeworld, and hurriedly blended into the crowd to escape notice. However, their appearance was monitored by DeGrayde who then reported it to Force Commander. Acroyear soon destroyed the Dog Soldiers sent against them and the three Micronauts fled to the lower levels to find Margrace and other fellow who told them of the current situation. (Micronauts I#44) - Disguised as religious pilgrims, the three Micronauts descended into Subzone and challenged the corrupt Temple of Light, which served the Body Banks. More Dog Soldiers appeared and the three battled them fiercely before drawing back to the rebels' base called Sanctuary. (Micronauts I#45) - Acroyear and fellow rebels made their way into the Body Banks with the aid of the Knights of Neep. Acroyear and Bug battled Dog Soldiers while the other rebels freed many captives. Bug and Acroyear then fought their way even deeper into the Body Banks. (Micronauts I#46) - Acroyear and Bug encountered Prince Pharoid being tortured and quickly eliminated the Dog Soldiers. They freed the prince but were challenged by the Death Squad. (Micronauts I#47) - A furious fight followed between the two Micronauts and the Death Squad, with Acroyear also combating newly arrived Dog Soldiers led by DeGrayde. Acroyear surrendered when he saw that Bug was about to be killed by Lobros. (Micronauts I#48) - Manacled but still in armor, Acroyear swung out with his chains at the Death Squad until DeGrayde threatened the lives of Bug and Pharoid. Pyrotorches were then used to strip Acroyear of his Spartakian armor, yet he showed no pain. The three captives were then escorted into the so-called Pleasure Pits to be held for the upcoming arena battle. (Micronauts I#49) - The three were later taken out into the arena to serve as entertainment for Force Commander's wedding to Belladonna (in Slug's body). Armed again with his energy sword, Acroyear was attacked by DeGrayde's monstrous Spider-Creature but dealt the killing stroke. Rebellion broke out from the stands of the arena with Acroyear, Bug and Pharoid quickly joined by Marionette and Huntarr. They all watched stunned as Baron Karza in his black armor ripped apart and stepped out from the white exterior of Argon, Force Commander, just as Bioship arrived with Arcturus Rann on board. (Micronauts I#50) - The Micronauts in the arena once more fought the Death Squad, with Acroyear slaying Ampzilla before turning to face their true foe: Karza. Margrace led a charge against the assembled Dog Soldiers, giving the Micronauts clear passage to the despot. Acroyear quickly climbed to Karza's raised platform, with the black-armored villain's knocking out Acroyear. Fireflyte's song served to distract Karza from certain victory over the Micronauts and teleported them away. (Micronauts I#51) - Acroyear and the Micronauts fled from Karza's forces aboard Bioship, but the exiled king was angered by Rann's decision to run away. Donning spacesuits, Acroyear Bug and Marionette took the fight outside. Using his sword, Acroyear destroyed several hostile spaceships and Dog Soldiers. Triumphant, they beamed back inside but saw the unbelievable carnage wrought by Karza on Homeworld far away. Hoping to warn others, they encountered the homeless Acroyear fleet commanded by Cilicia and were brought on board, with Acroyear seeking to prove his innocence in trial by combat according to Spartakian law. (Micronauts I#52) - Acroyear, who sought peace, was painted in the colors of his tribe before facing Cilicia, who advocated war. She fought him but he would only block her blows, refusing to fight the woman he still loved. He was able to grip her in a tight embrace that cracked her abdominal armor, revealing the shine of her pregnancy. The duel was halted with the welfare of the unborn ruler seen as paramount. Acroyear was no longer considered king and the Acroyear people now chose neutrality. Acroyear was pained by the loss of his wife and race. (Micronauts I#53) - Acroyear had his armor welded onto him by his fellow Acroyears, never flinching despite the pain, with the traitor brand on his forehead seared off by a Spartakian elder to signify redemption. Despite the Acroyear people's newfound neutrality in the war with Karza, Acroyear stayed with his fellow Micronauts aboard Bioship. Seeking new allies, Acroyear and the Micronauts traveled to Prisonworld and met Little D, who gave them mobster disguises, but they were soon attacked by Karza's G-Men. (Micronauts I#54) - Overwhelmed by the G-Men, Acroyear and the Micronauts were captured and brought before the Karza-controlled Tri-Bunal, and sentenced to death. Murder-1 and Little D helped the Micronauts overthrow the corrupt system on Prisonworld, eliminating Karza's influence there. (Micronauts I#55) - On board Bioship, Acroyear practiced his sword skills against a remote, but was saved by Bug when the artificial foes generated by Acroyear's subconscious almost killed him. He later welcomed Huntarr back after the living weapon's solo mission and declared Huntarr a fellow Micronaut. (Micronauts I#56) - The Micronauts next traveled to Bug's world of Kaliklak, where they were helped by Treefern to stop the destructive Battle Beetles sent by Karza. Along with his teammates, Acroyear witnessed the hatching of the new queen of Kaliklak, Lyca, and soon after welcomed Rann back into the fold. (Micronauts I#57) - The Micronauts journeyed to Never-Summer after discovering another world-killing plot of Karza from Captain D'ark. There they helped Ojeeg destroy the Sunscope weapon and fiercely battled Karza before the tyrant escaped by phasing away. The team then watched sun and life return to the world. (X-Men/Micronauts#1 (fb) - BTS) - The Entity (the dark side of the X-Men's Professor X that had gained a life of its own) traveled to the Microverse, and used vast telekinetic powers as well as telepathy to attack the Microverse, rapidly slaughtering and enslaving entire races. Acroyear and the Micronauts were forced into an uneasy truce with Baron Karza to oppose the Entity. (X-Men/Micronauts#1) - Investigating the destruction, the Micronauts found the frontier worlds devastated and battled the Entity-controlled D'arnellians. However, the Entity then entered the fray, captured the Micronauts, and destroyed D'arnell, while Karza fled aboard the Bioship. (X-Men/Micronauts#2) - The Entity toyed with the Micronauts in the mindscape, forcing them to fight Weirdlings. In Acroyear's case, the Entity showed Cilicia giving birth to an albino boy and naming him after his hated brother. The Entity eventually bent the Micronauts' wills to its own. Each Micronaut was then given a costume mimicking that of the original X-Men. When the real X-Men traveled to the Microverse to oppose the entity, the relative giant Micronaut X-Men overpowered them, with Acroyear smacking Nightcrawler down. (X-Men/Micronauts#3) - Alongside the other Micronauts and the similarly enslaved X-Men, Acroyear fought against Karza's Dog Soldiers, forcing their surrender, only for the Entity to completely slaughter the prisoners. Later, back within a prison cell on the world created by the Entity, the X-Men and Micronauts rallied themselves to again oppose the Entity, despite almost hopeless odds. Escaping into the catacombs of the Entity's citadel, Acroyear revealed that he feared the Entity, finally overwhelmed by the shame and destruction he as king had wrought. The X-Men and his fellow Micronauts helped him recover and continue. (X-Men/Micronauts#4) - The X-Men and Micronauts again joined forces with Karza, and Fireflyte sang for them a portal through the Spacewall, enabling them to return to Earth, although they remained at relatively reduced size. They fought the New Mutants, who were mind-controlled by the Entity in Professor X's body. Eventually Xavier forced the Entity to flee back to its own dead body. 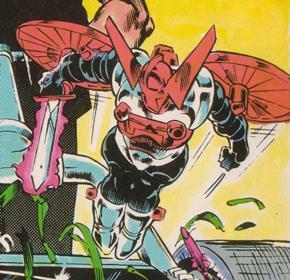 Fireflyte transported the Micronauts back to the Microverse, where Karza had been sent minutes before after having his mind restored to his own body. (Micronauts I#58) - The Micronauts returned to Homeworld to find it devastated and Coral dying at the feet of Karza and his mutated subjects. A savage and bloody fight erupted until Marionette killed Karza, thereby bringing peace to Homeworld. Acroyear let go his armor and donned the robes of a penitent so that he could better pray for peace. He later joined his teammates, boarding their new ship, Endeavor II. (Micronauts I#59) - Unsure of his new path, Acroyear practiced his swordplay, answering Biotron's query on what he thought love was by recalling his forced betrothal to Cilicia. Soon after, all the Micronauts agreed to depart on a new journey of discovery into the Microverse. (Micronauts II#1) - Searching for peace, the Micronauts set course for Fiame, but instead found themselves cast into unchartered territory. The team encountered the Child of the Makers. Not fully understanding what it was, they explored the small asteroid-like creature, finding themselves in its gut. (Micronauts II#2) - Increasing radiation forced the Micronauts to get out, with Acroyear using his body to shield them as they escaped. Acroyear refused to leave Huntarr behind and they helped the newly mutated Micronaut back on board. Huntarr had taken an egg from within the Child and Acroyear stored it away as the Child of the Makers launched itself away, its wake casting the team even further into unknown space. (Micronauts II#3) - Acroyear and Huntarr spoke about the latter's transformation before the group traveled to a nearby planet, which was actually a Proving Ground for an alien race. Once on planet's shiny surface, Acroyear observed large metallic creatures bound across the landscape and damage the shuttle before they could leave. Rann found that the atmosphere magnified light to laser intensity as it burned off the creatures but also recognized the immediate danger from the imminent sunrise. At the last minute, the ship was pulled underground with Micronauts inside. (Micronauts II#4) - Safe, the Micronauts explored the new technology-rich environment below the surface, with Acroyear guarding them. Acroyear, Huntarr and Bug battled killer ordnance-testing machines like humanoid robots, with Acroyear using his energy sword to also stop an energy vortex and the three demolished much equipment. The friendly Children of the Dreaming Star then appeared and were astonished at the range of the Micronauts' forms. (Micronauts II#5) - The Micronauts rushed to their damaged spaceship which had been brought in by the Children of the Dreaming Star. They were then invited and taken to Sphere, the capital planet of the Children. Acroyear spoke to Rann about his personal trials. They all saw the splendor of Central City and saw a version of himself with Bug's antennae, a combination created by one of the admiring shapeshifting Children. The Micronauts were shown the Spiral Path and heard the Children's origins, how an egg led to the birthing of the Children's species. (Micronauts II#6 - BTS) - Leaving Sphere with Solitaire, Bug imagined Acroyear, along with the other Micronauts, getting into all sorts of dire trouble without him. He then resolved to return to them. 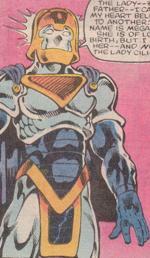 (Micronauts II#7) - Acroyear reflected on his time with Illyrie while talking with a phantom vision of Cilicia. (Micronauts II#8) - Arcturus Rann, Marionette, Acroyear and Bug became extremely ill from severe radiation poisoning from their encounter with the Child of the Makers and were placed in one of the facilities of the Children of the Dreaming Star, watched over by Huntarr and guarded by Death Watch minions. The Children offered a computer program that would let those dying be more at peace in their last hours and they joined for "one last dance". The newly hatched Prime Being Scion, seeking to help, triggered a change in Huntarr who then exploded outward, cocooning his four dying fellow Micronauts. He then resurrected them, recreating them as they were in the idyllic setting of the dance program. Huntarr then morphed back into his normal fanged self and was welcomed by his regenerated friends. (Micronauts II#9) - Along with the other Micronauts, Acroyear learned more of the Children and accompanied them to the Dreaming Star, where telepathic linkages were augmented. Acroyear watched on as Rann, feeling the Pain Wave, achieved communion with the Star and was able to make Devil materialize in a distorted form, with the degraded matrix then shifted to Biotron for storage. Suspicious of Solitaire, Acroyear joined his team on a mission to return to Homeworld with the aid of the Grand Fleet. 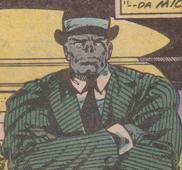 (Micronauts II#10) - On board the Endeavor II, Acroyear commented that he felt uneasy about returning to his people. The Micronauts' ship came to a sudden stop at the Spacewall. The team then ventured out onto the Spacewall. Rann's efforts to pierce the Spacewall with Marionette were thwarted by the the giant Time Traveler, and they watched the Enigma Force being devastate the fleet. Huntarr and Acroyear helped free the injured forms of Rann and Marionette from their capsule. (Micronauts II#11) - Acroyear piloted the Endeavor II and approached the Spacewall after the Children's fleet had left, but saw an Acroyear fleet led by Cilicia on the other side. Confronting his shame, he hailed them. Cilicia did reveal that they had encountered Breachpoint, an ancient powerful citadel that pierced the wall, and the two groups met there. Acroyear and Cilicia confirmed their love for each other, but that she still considered him a traitor. The Time Traveler attacked Breachpoint and Acroyear used a royal command override to order the fleet to retreat before Breachpoint exploded. He barely managed to escape back on board the Endeavor II, where he encountered Scion claiming captaincy of the ship. (Micronauts II#12) - Acroyear challenged Scion before his fellow Micronauts, but first had to focus on escaping the blast from Breachpoint's destruction. Scion and Acroyear then fought fairly evenly until Scion used Huntarr to morph and smother Acroyear, and the brawl ended. Scion pushed the Endeavor II through the Spacewall. Meanwhile, Acroyear still questioned Solitaire's purpose. (Micronauts II#13) - Acroyear sought to help the pained Huntarr, who was trying to save Devil's matrix from degrading any further. Scion told the crew briefly of the Pain and that they would soon be going to Fiame. There, Scion had them investigate a huge ship of the Wanderers' descendants. Finding metal poisonous, the Wanderers' descendants reacted violently against Acroyear's armor. The other Micronauts joined in the fray, eventually finding the ship's "brain", and with it the three Zodiac Keys that then appeared. (Micronauts II#14) - Scion revealed to the Micronauts that the Zodiac Keys held the codified origins of life in the Microverse. They arrived at the planet Aegis to investigate the Pain Wave and were shocked at the vast number of refugees seeking to escape the Pain. Later, Scion secretly caused Bug to become cocooned and Acroyear tried to free his friend but was violently repulsed by a force field. Solitaire and Marionette were able to finally free Bug. (Micronauts II#15) - Acroyear, Bug, Huntarr and Solitaire listened to Marionette tell a tragic tale of her past caused by the manipulations of Baron Karza. (Micronauts II#16) - Acroyear comforted Marionette that they were all subject to personal guilt of past deeds. They were suddenly called out to help nearby refugees to stop a panicked red-headed alien from launching a starship that was set to incinerate the surrounding encampment, but the explosion was contained by the Beyonder. Acroyear was nevertheless suspicious of the Beyonder's apparently positive intentions. 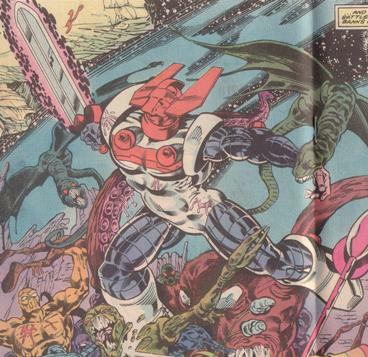 After learning of the Beyonder's destruction of three planets to stem the Pain Wave, Acroyear and the other Micronauts fought Scion, who seemingly perished from the group's combined onslaught. The Micronauts then left for Homeworld to continue their mission to save Devil. (Micronauts II#17) - The Micronauts arrived at Homeworld and were shocked to see the devastation worse than before because of the Pain Wave. They found the teleportation device initially used by Devil but the Pain Wave possessed him, malforming him into a giant beast. Acroyear and the others fought Devil, with Acroyear holding back so as not to severely injure his compatriot, but was instead cast aside. He then watched Huntarr generate a special gun that killed Devil, thereby stopping the Pain Wave manifesting. (Micronauts II#18) - The Acroyear fleet had withstood the Pain Wave and arrived to destroy it. Acroyear readied himself to once more meet Cilicia and told her of the Pain Wave that still threatened the Microverse unless Homeworld was destroyed. Manipulated by the reborn Scion, Cilicia ordered Homeworld be eliminated but this was temporarily stopped as Acroyear slashed at her armor so that she could give birth to their son. Acroyear then watched as the bridges between Homeworld's spheres were destroyed by the Acroyear fleet. He bade Cilicia farewell and followed Scion through a teleportation portal. (Micronauts II#19) - Acroyear rejoined his fellow Micronauts on one of Homeworld's spheres and watched as the planetoids separated. They then saw Solitaire and Scion engage in a tumultuous battle. The fight ended, Solitaire told the eons-old origins of herself and the Microverse, but that the Micronauts would have to sacrifice themselves to save the Microverse. Rann then told them how this could be achieved using the Prometheus Pit to counter the Pain Wave. Initially repulsed by the corrupted Pit, Rann helped restore the Pit's natural function. Acroyear declared that he would be honored if Huntarr would join him and the two willingly fell into the Pit. (Micronauts II#20) - The life energies of the Micronauts helped heal Homeworld's Worldmind, and Acroyear found himself in an idyllic setting at a natural pool. Touching it with his gloved hand, he could feel his cells swim away to become the new life of Homeworld, ultimately contributing to proud forests and stalwart mountains. (New Mutants I#50) - On a fringe world planet somewhere far off in space at M’n’den’s bar, Charles Xavier passed by the Micronauts Acroyear and Bug near a slave auction pit after initially going past Rann, Marionette and Fireflyte. Comments: Adapted by Bill Mantlo (writer), Michael Golden (pencils) and Josef Rubinsten (inks). Acroyear's appearance in New Mutants cannot be 100% confirmed, but the characters there look exactly like the Micronauts. Maybe the recreation of Homeworld led to the eventual rebirthing of each of the Micronauts... (well, 3 so far)? Special thanks to Loki for identifying this appearance! Karza had four protrusions that were chest-mounted cannons, but I'm not sure what purpose the two chest protrusions served in Acroyear's case. 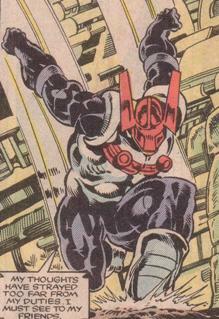 Acroyear's name was revealed to be "unpronounceable" in Micronauts Special Edition#1. The original Mego Micronaut toy figure and description, while similar in appearance, is like a different character as he is aligned against the Micronauts - likely an Acroyear soldier, not the Acroyear. Main image cleaned up by Ron Fredricks. Prince Acroyear's father was the former king of Spartak (and was likely called King Acroyear at the time). He commanded his son as the Crown Prince to forgo his feelings for another and that he instead marry Lady Cilicia to ensure Spartak's continuity. Micronauts Special Edition#4 (March, 1984) - collected Micronauts I#8-10 and featured a short opening essay by Bill Mantlo called The Enigma of the Enigma Force.